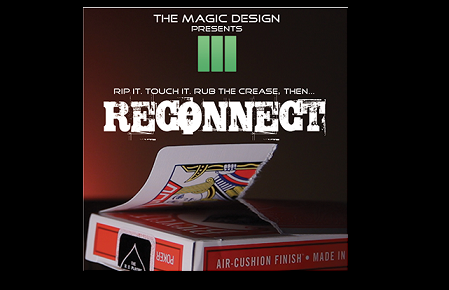 RECONNECT is a direct, visual and practical torn and restored routine! Use ANY CARD. The card is clearly ripped and visually restored. You never have to fold or damage cards so the same deck can be used with other routines. The card can be signed and given away as a souvenir. RECONNECT is perfect for working professionals and hobbyists for it's ease of operation, instant reset and multiple uses. You will be creating new ideas in no time! RECONNECT is a torn and restored for the REAL world!